Bar wristbands offer several benefits to establishments that serve alcohol. The benefits appease patrons and staff, alike. Non-transferable and brightly colored, bar wristbands make it easy for bar staff to visually verify that a patron has paid the cover charge and had their ID verified. Plus, if a guest needs to leave briefly, they can return with a quick flash of their wrist to the bouncer or greeter. No worries about lost tickets or smudged stamps. If you want to increase spending, bar wristbands are the way to go. Whether patrons are bellied up to the bar being served by a bartender or seated at a table with an assigned server, the bar staff doesn't have to spend time checking IDs. As flattering as it is to get carded the further away people get from age 21, digging for IDs in a purse or a wallet is a time-consuming distraction. People go to bars to relax, chill out and enjoy some good conversation with their friends. By having a bouncer or greeter check IDs at the door, and then securely fasten a wristband to the guest's wrist, the night seems to run more smoothly. All servers need to do is quickly glance at the wristband to know that the person sitting before them is a welcome guest and of legal drinking age. This saves everyone time. Guests who don't have to wait are happier and tend to spend more money. 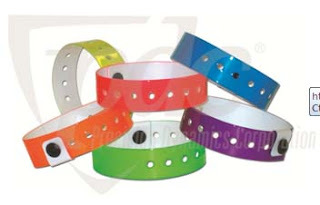 Bar wristbands not only provide general admission into an establishment, but also assist with access control. Access control is especially important in a 21 and over club where there is live entertainment, like a popular band playing. Members of the band, along with their crew, can be given designated, customwristbandsfor access to authorized areas, enabling them to setup and take down the stage more efficiently. With a quick glimpse, bar staff can identify and distinguish performers from guestsand even attempted "party crashers." There are two additional ways you can beef up security with bar wristbands. The first is to rotate wristband colors for different nights of the week. That way, if someone tries to get in with the wrong color wristband—especially someone under age—you can quickly “86” them. The second tactic is custom printing, which helps to prevent counterfeiting. Try custom printing the bar's logo on the wristbands, along with the date. Both of these strategies will prevent people from coasting in without having their ID verified. If you do have a cover charge, both of these strategies will also ensure that patrons do no sneak in for free by reusing a wristband from the night before or last week. Speaking of custom printing, including the bar's logo or any promotions on a bar wristband is an excellent marketing strategy. Bar wristbands turn into walking mini-billboards for your business. If someone has a great night out at your bar, they may keep the wristband on for a few days, maybe even weeks. People they encounter at work, the gym, restaurants are sure to inquire about where they went and what the experience was like. People may approach them and request a testimonial, "I heard that place was fun and had great service. Is it really that good?" Word of mouth can spread like wildfire! Custom printing is an excellent catalyst to get the conversation ball rolling. If you choose to custom print a promotion, there are a couple of different ways to go about this.To increase sales for that night, print a drink special on the wristbands to promote a premium brand. Reinforce the special by having your staff remind them of the promotion that's right on their wrist. Not only will you increase sales for that night, but patrons will likely start associating your bar with that premium brand that they enjoyed and want to come back for more. A second promotional strategy is to imprint a coupon on the bar wristband. It should be a special that motivates patrons to return. A couple examples include, "buy one drink, get a second one free" or, "try our new microbrew, get a free appetizer." Bar wristbands have the ability to ignite a good memory of a good time and motivate the 21 and over crowd to return to your well-run establishment.